It’s not too late to submit your #MyICHero!! We want to know who (or what) gets you through your day! We will share your stories on ICA’s social media channels throughout the rest of the year. We will also include a select group of stories in an upcoming issue of ICA Update. Your #MyICHero might be a healthcare provider, friend or family member, spouse, organization, support group leader, online support group, medication, product, spiritual leader—or someone entirely different. To create your social media frame, go to https://twibbon.com/support/my-ic-hero, click the “Login to Add Twibbon” button. Once you are logged in, click the “Add to Twitter” and/or “Add to Facebook” button, and follow the on-screen instructions. (Please note that if you add the Twibbon from your phone or tablet, it will automatically select your profile picture.) Then, create a “public” post that tells the story of your #MyICHero. 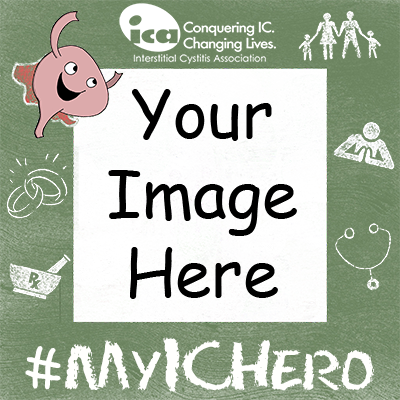 Please be sure to use the #MyICHero and tag @ichelp (Twitter) or Interstitial Cystitis Association (Facebook), so we are able to share your story, which will help spread more IC awareness. Not on social media or having issues creating your image? You can still participate by sending a photo along with your story to icamail@ichelp.org.